St Pierre du Bois Church, Guernsey A fairly steep aisle to reach the altar! 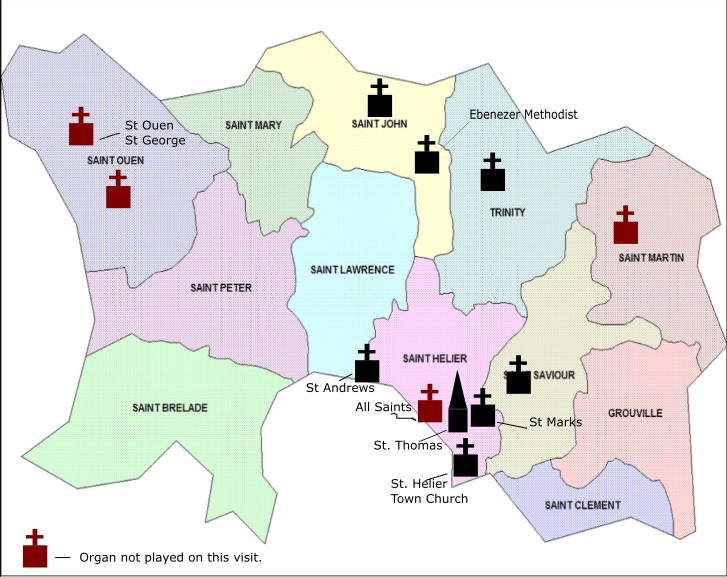 I was born in St. Saviour, Jersey and whilst at school at Victoria College having begun to play the organ first at St. Lawrence Church, I became Assistant Organist at the Town Church to Stanley Sackett ARAM, ARCM, FRCO(CHM). Stanley was organist of this church until his death in September 1997. He was held in great affection by very many as such a modest, kind man with such a great talent on the organ and piano of music of every genre. Nothing was beyond his ability. He played the theatre organ at the Forum Cinema for musicals and pantomime. He was equally good at recitals on some of the smaller organs in the island as at Notre-Dame, Paris, amusing sketches on the piano or serious virtuosic pieces, or accompanying annual oratorios with orchestra conducted by Sir William Armstrong at Wesley Grove Methodist Church. He played for the live broadcast on Channel Television when Her Majesty Queen Elizabeth, the Queen Mother came to the church in 1963 and presented a pair of silver candlesticks and a cross to commemorate the fortitude of the islanders during the German Occupation. At this service, Stanley generously allowed me to play for her at the start of the service. He was my inspiration to become a church organist and a invaluable friend to my family. When Andrew Stevens, formerly of The Village Workshop, now working independently with his wife, Lynn, offered me the opportunity to accompany them on their twice yearly visit to maintain and tune organs in Jersey and Guernsey, I jumped at the chance. Many of our members will know that Andrew maintains the Royal Hospital School Chapel Grand Organ. Andrew worked with the late Reg Lane of Hill, Norman and Beard who visited the island for 50 years but Reg had come to Jersey since the early sixties when I first met him. I also knew that the 22nd October had been Stanley's birthday and so twenty years on, I attended the 11pm Parish Service on the Sunday. Playing the organ for the service was Daniel Speck, whose father was Rector of St. Ouen, and had been Vicar of St. Johns Church, Woodbridge when we moved there in 1984. Daniel played 'Happy Birthday' to a long standing member of the Choir, Margaret Jones, as her birthday is the following day and she recollected how Stanley used to weave the tune of Happy Birthday into any recessional music he was playing. Andrew and Lynn flew into Jersey during that Sunday morning and headed straight to St. John's Church where he keeps his box of tools. On arrival in the church, Lynn was key holding and Andrew was buried inside this two manual organ which was originally in Great Union Road Methodist Church built by Euston Ingram in 1884, rebuilt by James Ivimey in 1968 and then enlarged to 21 stops by the Village Workshop with electric action. I was soon to get used to the sound of the C side or C#side full tone scales on many of the organs that Andrew tuned and the means of using the Principal stop to lay down the correct intervals for an equal tempered scale moving in fifths and fourths within the within the middle octave. In this process is the invaluable skill of the organ tuner very evident. I was unaware of how the pitch was maintained for each organ; the answer: the pipe for middle C is of a fixed length from which all the others are tuned. This organ has 21 stops, the overall effect was very full with quite a punch. As Andrew packed up his tools, I played Choral Song by SS Wesley. A quick dash across the island this first afternoon was to the next church on his list, St. Saviours, but we had to return there again on the Wednesday. St. Saviour is famous for Lillie Langtry, the Jersey Lily, whose headstone can be found in the very large churchyard. 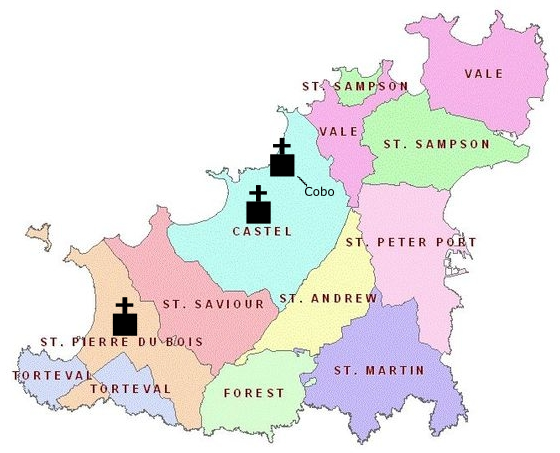 Her father was Rector and later Dean of Jersey. The church was originally four chapels next to one another but unconnected. In an enlargement in the 13th century the church was lengthened and in the 14th century the great central tower was added under which the detached two manual console sits with the organ case in a gallery nearby. The church is very dark inside with unpainted stone vaulted ceilings and stained glass to every window and perhaps not unsurprisingly it has two chancels and two naves side by side. The final visit of the afternoon was a visit to the Town Church organ to investigate why the tenor B on the Swell was silent but fortunately still operating when coupled from the Great or the Choir. This proved to be a circuit board fault which Andrew resolved later in the week. Playing the Fanfare Trumpet stop on the West Gallery was still a surprise in store on the tuning visit and would be well worth the wait! Monday morning found Andrew climbing up a rope to get into position inside the organ high up in the West Gallery of St. Thomas Roman Catholic Church, 'The French Church', consecrated in 1893. Organ tuners have to be very fit to reach their pipes! The Church has recently been completely redecorated with splendid artwork on the walls. Spectacular colourful design and gold leaf work on the front organ pipes is particularly impressive. This was done in situ perched on narrow scaffolding forty feet up from the church floor. The two manual 1859 Henry Dyer organ in St Thomas was remodelled by Henry Willis. Interestingly Henry Dyer was an organ builder in Coggeshall. This organ, in this fine acoustic, sounds magnificent, and was a recent destination for the Organ Club at Andrew's suggestion. Grayston Ives' Intrada and Priere de Notre-Dame by Boellmann completed this visit. Our next destination was Trinity Church with its spire rendered in white cement and here is a two manual delightful organ in a commanding position on the west gallery. The inside of the church, in complete contrast to St. Saviours is very bright with white render. In a very good state of tune, Andrew soon had this ready to play and Thalben Ball's Elegy worked well with excellent contrasts of registrations possible. 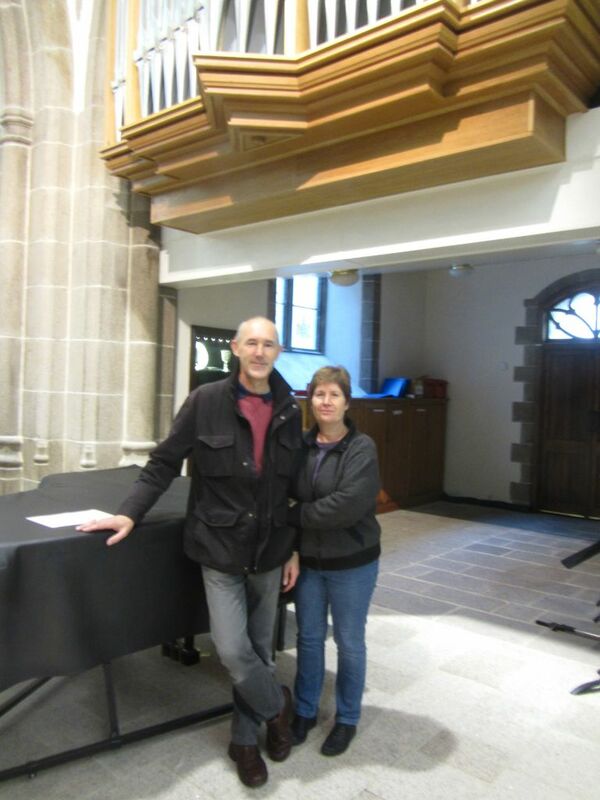 Before I rejoined them, Andrew and Lynn had tuned the organ at St. Martin's Church. At Ebenezer Methodist Church, the John Walker and Sons 1923 organ in a prominent position in the church paid for playing. This is a surprisingly small Walker organ where each of the nine ranks of pipes had something to say but only a slim tuner would find them easy to access. These lovely stops often individually gave good effect to No VII of Edward Elgar's Vesper Voluntaries, Poco Allegro in D major and Coda. Organs are also thirsty beasts and need hydration with a bowlful of water left at each one! On Tuesday morning we had a very early start and met Andrew at his hotel at 6.15am giving Lynn a day off as we flew to Guernsey on a sunny morning noticeably different from the violent storm of the weekend when we arrived where the waves crashed over Corbiere Lighthouse. In this smaller Channel Island, I was to have my first ever experience of being the key holder for an organ tuner. Our first church was St Pierre du Bois memorable for its fairly steep aisle and its 1906 Norman and Beard 12 rank two manual organ. The first task was to check that the organ blower was not surrounded by water in the access pit under the aisle. It was dry! I learned my new task of key holding under Andrew's tutelage. John Ireland, who was organist of the Town Church in St. Peter Port just before the Second World War seemed very appropriate here and I played Holy Boy and Intrada. The organ touch especially when coupled up was a good workout for strengthening the fingers especially 'Jerusalem' and asking Andrew what his favourite hymn was, he asked for the tune 'Wolvercote'. An excellent choice! Unfortunately, Andrew particularly wanted to introduce me to the organ in Torteval but that wasn't possible as it is under dust sheets while the church is being refurbished so we moved on to a two rank, two manual multi-stopped extension organ in Cobo. This was a house organ owned previously by a musician in Jersey. Here Andrew was to meet a former employee of Hill, Norman and Beard who was to tell of some Guernsey organs that are looking for new homes before they end up in a skip. The organ is in a tight corner and the sounding pipes are enclosed by a hinged door housing decorative organ pipes. When swung the two ranks of pipes on their soundboard could have been rolled out like a kitchen drawer right over the console below without sufficient anchorage to hold them safely. A dangerous hazard for an organ tuner. This was left firmly in place and Andrew instead stood on the organ console to reach the pipes. Extremely gentle taps have a major effect on the tuning of especially the small pipes, I noted. Closing up the organ was done with great care so as not to alter the tuning. I unwisely chose to play 'Ich ruf zu dir' by JS Bach' unaware of which stops were extensions with the consequent dropping out of unheard notes. After a convivial lunch with the retired organ builder, the organist of our next church and my Guernsey friends we repaired to St. Marie du Castel with its wonderful view over the island. Here is an 1903 Alfred Oldknow organ who was the only builder of organs in Jersey. It sits in the South Chancel with a detached Console. Here the problem was a dead range of upper notes. Access was needed to the set of boards and this required removing a set of front pipes at ground level to enter inside. The wiring diagram was carefully perused and the correct board extracted. Fortunately a spare board was ready to replace it and the tuning of the 17 rank instrument with tab stops was ready to begin. By now I had appreciated how Andrew was working but the narrowness of the space in which he was working made it efficient to tune all C side ranks first as he had no room to turn and then C#. As we were no hurry to return to Jersey some more John Ireland, Sursum Corda and Villanella was played, followed by Fidelis by Whitlock, Scherzo by Bossi, Aria by Manz and Aria by Ian Tracey. As the heavy tool box was checked in at the airport, I reflected on a most enjoyable day out and my new knowledge of being a key holder in the organ tuning process. On Wednesday, Andrew and Lynn were at St. Andrew's Church, First Tower. Here is another Alfred Oldknow attached console in an organ with 24 ranks in a reverberant space. The layout of the stops reminds me of the TC Lewis St Peter's Sudbury organ. The pedal electronic pipes add to the powerful stops on Great and Swell and Rheinburger's Cantilena sounded well. Andrew and Lynn went to All Saint's Church in the Parade in St Helier and I rejoined them in the afternoon at St Saviours finishing with Sicilienne by Maria Theresa von Paradis. Sadly, St. Simon's Church is closing so much later in the afternoon we were in St. Mark's Church where I had been baptised. Actually being in the church brought back the memory that it was the hymn 'All Glory Laud and Honour' heard at a Palm Sunday service when I was about 4 or 5 years old that had inspired me to want to play the instrument. Here again to tune this organ, Andrew risked life and limb precariously balanced high up on the Swell case to reach the trumpets. Before we left, although it was now dark outside I chose Chanson de Matin by Edward Elgar and concluded with Fanfare and Processional by Douglas Wagner. Thursday: Andrew and Lynn went to the Parish Church of St Ouen's and St Ouen St George. In the afternoon the moment I had been waiting for, to hear the St Helier organ back in full voice after it had been completely silent for an extended period while the church was having a makeover with underfloor heating. This Hill, Norman and Beard organ was updated by John Compton Organ Company in 1962 when the new detached console was made. The previous organ as I remember it was in a crypt like space, probably the original chapel a thousand years earlier, next to the Chancel unable there to give full voice to its wonderful Swell which had been voiced to Stanley Sackett's wishes. Now the new enclosed Choir case speaks into the Chancel and the main organ in the South Gallery has some additional electronic pipes on the Pedal, some of which are amazingly authentic. Now the organ can breathe and what a breath. The Fanfare Trumpet in the West Gallery speaks with a powerful voice, which at the detached console balances well with full organ because it is behind you. Unfortunately though for those directly in its line of sound, it can tear the hair off your head. On Andrew's next tuning visit to Jersey in April, this rank of beautiful pipes will be removed from the West Gallery and installed facing upwards in the South Gallery were they will have more of a Tuba sound, I'm told. Andrew resolved the problem of the absent B on the Swell. Organ Tuners have to be very versatile in problem solving as these instruments are now very complex. After many hours of work and in time to return his toolbox into safe keeping at St. John's, Andrew and Lynn flew home from the island. They did have time to listen to David German's Festive Trumpet Tune, Song of Sunshine by Hollins which Andrew said was an especial favourite of his and finally Tuba Tune by Norman Cocker. Having very kindly been lent the keys to St. Helier organ by the Vicar, the Rev. James Taylor after the Sunday Service, I was able on Friday morning to set a combination with divisional and generals so that in the afternoon I could entertain a few friends and members of the congregation for two hours who came to listen to this splendid organ.